960th Quartermaster Company ceremony in July 2007 in Sioux City, Iowa, during which World War II veterans CPT Albert Smaha, 1LT Jefferson Wiggins, and CPT William Solms, of the 960th Quartermaster Service Company, were invited to hang the unit's WWII campaign and decoration streamers on the company guidon. The 960th Quartermaster Service Company activated on 5 August 1943 at Camp Phillips, Kansas, as an African-American unit commanded by a white officer. The company drilled and trained over the next several months, learning how to set up a bivouac and practicing security and night patrolling duties. On 27 February 1944, the 960th (then consisting of 3 officers and 222 enlisted men) sailed from New York on the troopship UST Frederick Lykes, arriving in Glasgow, Scotland, on 11 March 1944, and traveling by train to its assigned station in Westbury, Wiltshire, England. The officers were billeted in a private home while the enlisted men stayed in barracks. In England, the unit was faced with certain challenges. The cooks experienced difficulty learning how to use the unfamiliar British equipment in the mess hall kitchen. The unit commander, Captain Raymond H. Kelm, noted the initial lack of recreational facilities for the men, which was later alleviated by the addition of "a day-room for dispensing beer." The 960th also lacked experienced non-commissioned officers due to, as Captain Kelm stated, "the peculiar problem of having a cadre [of NCOs] who had less time in service than the men under them." Nonetheless, the unit did well in its mission of moving supplies, and the officers and men of the 960th were commended in a letter from the Commander of Depot G-47 for their excellent work. By October 1944, the 960th Quartermaster Service Company had moved into France and from there into the Maastricht area in the Netherlands. Overwhelmed by the high number of casualties which resulted from the liberation of the Netherlands, the U.S. Army assigned the Soldiers of the 960th, now under the command of Captain William O. Solms (who as a First Lieutenant had assumed temporary command of the unit when it was first activated), to a duty for which they had not trained or prepared: the digging of thousands of graves in what would become the Netherlands American Cemetery in Margraten. The company was housed in a cold and drafty old warehouse during this period. In remarks made in 2007 to the Sioux City Journal, Albert Smaha, one of the surviving unit leaders who became a commissioned officer, recalled the piles of bodies and the difficulty of digging the frozen ground. He offered the popular opportunity of hot showers in nearby Maastricht for those who succeeded in digging two graves a day. As recalled by another unit member, First Sergeant Jefferson Wiggins (later commissioned as a Second Lieutenant), it was a difficult and traumatic experience, dealing with piles of maimed bodies, and the pain was compounded when he discovered, years later, that demeaning stereotypes of the black Soldiers had been published by a Lieutenant Colonel who was in the area at the time. Wiggins was filmed for a Dutch documentary on the Netherlands American Cemetery in 2009 and featured in Connecticut Magazine in November 2012. According to him, the men of the 960th worked 12-hours days for three months without a day off. In the unusually harsh winter of 1944, snow and rain destroyed some of the graves they dug. They buried the dead and conducted makeshift services for them, contributing prayers and hymns. Today, the Netherlands American Cemetery and Memorial covers a 65.5-acre site and contains the remains of 8,301 American and Allied service members (43% of the total originally buried in the area, as some of the remains were later moved at the families' requests) and a monument to the missing in action. The 960th Quartermaster Service Company for superior execution of duty in the performance of exceptionally difficult tasks. From 11 February 1945 to 13 April 1945, the 960th Quartermaster Service Company rendered meritorious service in the accomplishment of its numerous duties on the continent. Throughout this period, this unit achieved and maintained a high standard of discipline and demonstrated superior performance in every duty it was assigned. 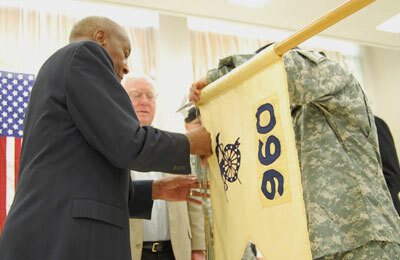 The conduct of the 960th Quartermaster Service Company is in keeping with the high traditions of the military service. Notice of the unit's Meritorious Unit Commendation was published in the unit's operational report of 24 October 1945, but unfortunately, knowledge of the award was subsequently forgotten until 2007, when Captain Keith Archibald, commander of the unit's lineal successor, the 960th Quartermaster Company (U.S. Army Reserve), in Sioux City, Iowa, discovered a reference to the award in the historical records he had requested from the National Archives and Records Administration. The U.S. Army Center of Military History located the Ninth Army General Orders confirming the decoration and added it to the unit's official lineage. Captain Archibald found three veterans of the World War II unit (Albert Smaha, Jefferson Wiggins, and William Solms, the former company commander) and invited them to hang the unit's four World War II campaign streamers (for Northern France, Rhineland, Ardennes-Alsace, and Central Europe) and the Meritorious Unit Commendation streamer on the 960th Quartermaster Company guidon. The ceremony was covered in the local press. Germany surrendered on 8 May 1945, and two days later, 21 privates of the 960th were promoted to the rank Private First Class. The operational report covering the period from May to September 1945 details many changes in unit personnel over the subsequent months, including the reassignment of many of the unit's men to permanent or temporary duty in other Quartermaster units and the movement of Soldiers in and out of the hospital as they became sick or recovered. Seven-day furloughs were granted to a number of Soldiers. New members joined the unit. There were also promotions among the enlisted men and NCOs. In May, First Sergeant John H. Phillips of the 960th was commissioned and rejoined the unit as a Second Lieutenant. In September, First Sergeant Jefferson Wiggins and Staff Sergeant Earl Wood also rejoined the company as Second Lieutenants. The unit changed location within Germany from Senne to Lesum in mid-May. Nonetheless, the unit report contains often repeated lines, "Routine operations performed," and, "Usual operations activities." In August, 80 of the unit's enlisted personnel were assigned to temporary duty with the 554th Quartermaster Railhead Company at Alsfeld, Germany. The company was frequently reassigned or attached to different Quartermaster battalions during this period. By late August, the unit had changed location a few more times, moving to Limburg and Giessen, Germany. The weather during the move to Giessen was noted as being rainy, but the morale of the company was recorded as "excellent." On 20 September 1945, Captain William Solms was reassigned, and 1LT James Worthington took command of the 960th. Finally, on 9 January 1946, the remaining members of the 960th Quartermaster Service Company sailed home from Belgium on the Hagerstown Victory, arriving at Camp Kilmer, New Jersey on 21 January. The unit was inactivated the following day, its members having been instrumental in creating a dignified final resting place for thousands of U.S. servicemembers who lost their lives in the Netherlands and having been recognized and decorated for their efficiency, hard work, and adaptability. 5 August 1943 to 31 December 1943. Captain Raymond H. Kelm, History – 9 March to 12 April 1944, Headquarters, 960th Quartermaster Service Company. Adjutant General's Office unit data card of the 960th Quartermaster Company; and World War unit locations card. Chris Dickson, The Foreign Burial of American War Dead: A History (Jefferson, North Carolina: McFarland & Company, Inc, 2011), pp. 112-113 and 197. "WWII vets of segregated 960th to receive long-overdue awards here," Sioux City Journal (Iowa), 16 July 2007. "FIRST Witness: Remembering Margraten," Connecticut Magazine, November 2012. General Orders No. 199, Headquarters, Ninth United States Army, 7 June 1945, Section III. Report of Operations, Headquarters, 960th Quartermaster Company, 24 October 1945.